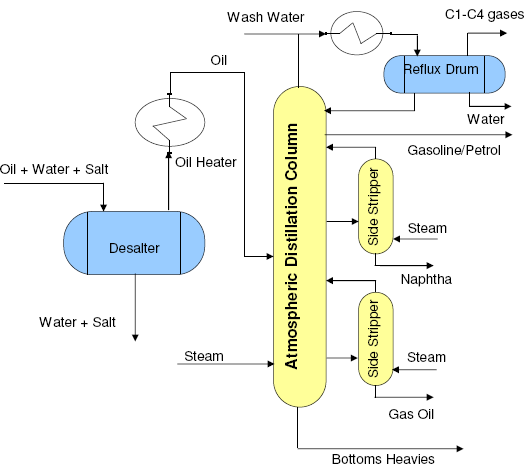 Crude oil is sent to the atmospheric distillation unit after desalting and heating. The purpose of atmospheric distillation is primary separation of various ‘cuts’ of hydrocarbons namely, fuel gases, LPG, naptha, kerosene, diesel and fuel oil. The heavy hydrocarbon residue left at the bottom of the atmospheric distillation column is sent to vacuum distillation column for further separation of hydrocarbons under reduced pressure. As the name suggests, the pressure profile in atmospheric distillation unit is close to the atmospheric pressure with highest pressure at the bottom stage which gradually drops down till the top stage of the column. The temperature is highest at the bottom of the column which is constantly fed with heat from bottoms reboiler. The reboiler vaporizes part of the bottom outlet from the column and this vapor is recycled back to the distillation column and travels to the top stage absorbing lighter hydrocarbons from the counter current crude oil flow. The temperature at the top of the column is the lowest as the heat at this stage of the column is absorbed by a condenser which condenses a fraction of the vapors from column overhead. The condensed hydrocarbon liquid is recycled back to the column. This condensed liquid flows down through the series of column trays, flowing counter current to the hot vapors coming from bottom and condensing some of those vapors along the way. Thus a reboiler at the bottom and a condenser at the top along with a number of trays in between help to create temperature and pressure gradients along the stages of the column. The gradual variation of temperature and pressure from one stage to another and considerable residence time for vapors and liquid at a tray help to create near equilibrium conditions at each tray. So ideally we can have a number of different vapor-liquid equilibria at different stages of this column with varying temperature and pressure conditions. This means that the hydrocarbon composition also varies for different trays with the variation in temperature and pressure. The heaviest hydrocarbons are taken out as liquid flow from the partial reboiler at bottom and the lightest hydrocarbons are taken out from the partial condenser at the column overhead. For the in between trays or stages, the hydrocarbons become lighter as one moves up along the height of the column. Various other cuts of hydrocarbons are taken out as sidedraws from different stages of the column. Starting from LPG at the top stages, naptha, kerosene, diesel and gas oil cuts are taken out as we move down the stages of atmospheric column. The heaviest hydrocarbon residue taken out from partial reboiler is sent to the vacuum distillation column for further separation under reduced pressure. The different cuts of hydrocarbons taken out at this stage are the result of primary separation and undergo further processing before being transformed to end products. Get your self expert in Process Technology with our TEXVYN PRO TRAININGS. Specialize batch under mentor-ship of industrial expert having more than 15 Years of Experience. Guaranteed Job Networking with professional from leading industry i.e. Jacobs Engineering, UDHE India, Petrofac, GS Engineering etc. Exclusive Training on SIEMENS Process Automation Suite. Complete Exposure to Industry Live Project..